Milton church, dedicated to St. Peter and St. Paul, is approached from the west by a long flagstone pathway with a lych gate and dates back to the 14th century. Earlier than this a church stood in Milton at least from Saxon times. What antiquarians regard as a surviving remnant of an earlier church on this site is to be seen low down at the south west corner where a filled in arch is part of the present structure. However, this cannot confidently be regarded as part of the church existing here in 1086 and noted in Domesday Book. A wrought iron gate of handsome design, which was cast by Robert L. Priestley Limited of Albion Parade, bearing a replica of Gravesend's first coat of arms circa 1568 can be seen at a point where the churchyard wall is of different construction to that farther westward. The reason for the difference is that until the early 19th century the churchyard terminated here. In 1805 a piece of manorial waste ground was taken into the churchyard and in the following year some more land was added on the north side. Both the lych gate and the iron gate were erected in 1951. The sundial over what was (from the 16th century until 1819) the south porch of the church has the motto: 'trifle not, your time's but short'. This remarkable sundial deserves close attention for its many interesting features. The rector, the Rev. Hilary Day, restored it in 1972. It was designed by James Giles, master of the Free School in King Street, and bears witness to his scientific knowledge and attainments. The method of telling the time by it is explained in Pocock (p.142) and The Kentish Traveller's Companion, 1779 (p.87). The porch was used as a vestry from 1819 until 1950 and is now a small chapel or shrine fitted out by the Rev. Day. The tower is probably of a little later date than the body of the church. It contains a peal of eight bells and is topped by a crown and formerly the Prince of Wales's feathers (which were lost in a storm in 1986). When Mr. W.G. Harpum restored this vane in 1954 a strip of metal was found inside that had the words 'G. Thomas 1842' on it and he added his own name and the date. There is a story that, when the work was being done in 1842, Queen Victoria passed in her carriage with the infant Prince of Wales en route for London and, hearing the bells being tolled in her honour, authorised the addition of the Prince of Wales feathers. Five of the bells were hung in 1656, one in 1810 and the other two in 1930. The clock was added in 1875. The base of the tower acts as a porch and in the left corner is the stairway to the ringing chamber. The doorway ahead leads into the rather narrow interior, there being no side aisles, with a gallery on the north side and a west gallery largely occupied by the organ. This was installed in 1829 as a barrel organ, was rebuilt in 1887 and renovated in 1936. A door on the left, formerly the north door, leads to the vestries, built and furnished in 1950, and also the Parish Centre added in 1992 at a cost of £240,000. The architect was David Croydon and the builders Constant and Durling. The interior of the church is an interesting example of 18th century plastering and ceiling and dates from 1790. Then the old lead roof was removed, the walls were increased by two feet and the present slated roof put on. Thomas Hall of Dartford did the work and the addition to the walls can clearly be traced on the outside. The east window, the only stained glass in the church, was given in memory of Dr C.J. Pinching in 1852. The two outer panels were blown out by enemy action on Tuesday 2 September 1940. There is no physical chancel but there is a sedila on the south side under the south east nave window. The corbels of a previous roof still exist with grotesque heads and other carving. The plaque in memory of General Gordon on the south wall of the interior was originally in Trinity Church and when this was pulled down a Mrs. F.M. Garrett of Milton Place rescued it. She presented it to Milton Church in 1985 and it was unveiled by the Mayor, Councillor E Gibson and dedicated by the Rector Rev. Hilary Day on 26 January 1986. On the eastern wall of the church is to be seen the outline of what seems to have been a very large window or, as has been suggested, a former chancel arch. 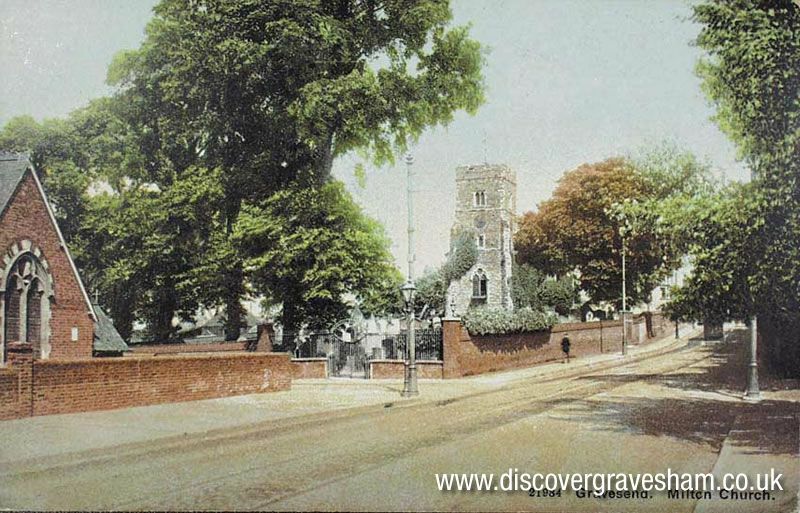 However, the Gravesend Historical Society could find no evidence of this from an excavation in 1976.